You have a wall in the office and you want to cover it with a physical printed map of your operating area. Your area of interest is large geographically – e.g. all of a major city – and you want a single map where you can see all the streets. If you are going to only use your map digitally, we can make it any size you want just tell how wide and how high. 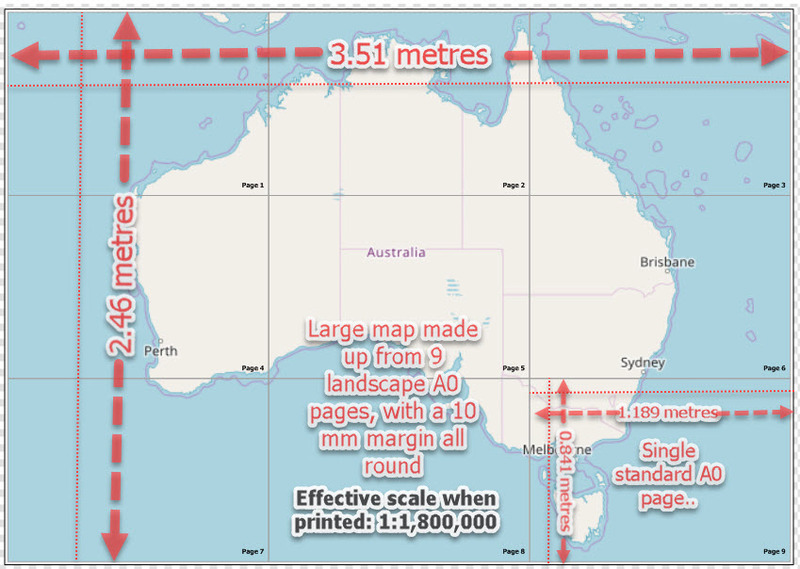 We can make and supply a single digital map document of that size. 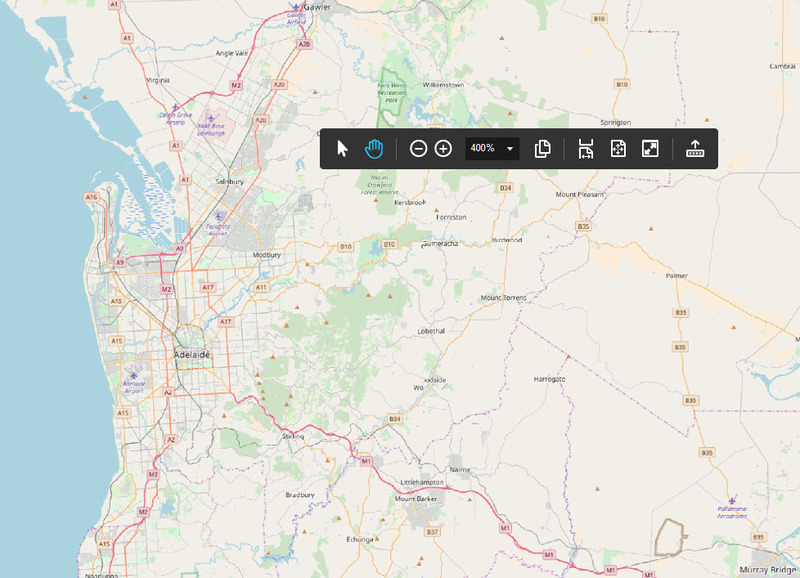 Bear in mind that physically large map documents like this can be very large files, so viewing them can require a lot of physical RAM (memory) in your viewing device – probably not a good choice if you’re confined to a tablet or phone! An alternative is to use multiple standard pages, as in the following illustrations, we can create these as separate individual pages, each of which is a much smaller file size than the whole page option in 1. above. 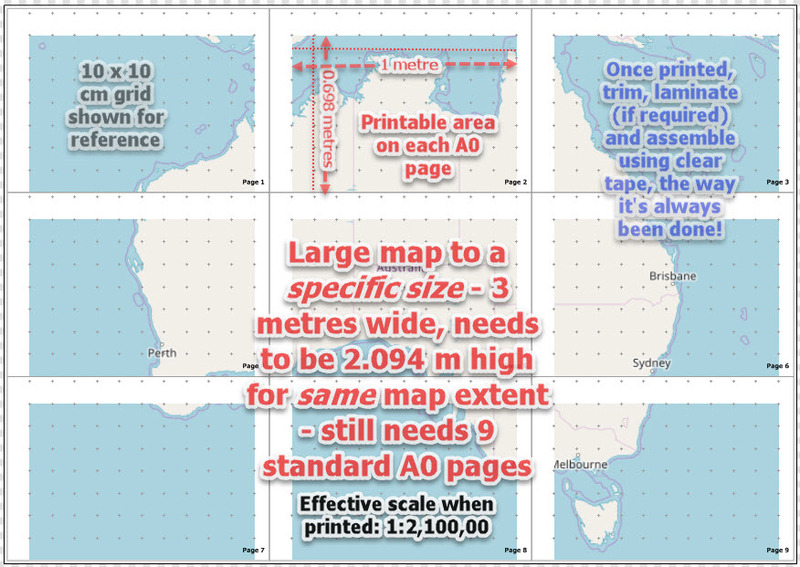 If you want to physically print out your giant map, here are some illustrations which we hope will assist you make the best choices for your own needs. The examples are based on multiple standard A0 poster pages oriented to landscape (we’ll use the best arrangement for any given map, but we can use page sizes and orientations you specify just as happily). It is best to use standard pages if hard copy is the objective, as very few commercial printers support single page custom sizes at high resolution. Large map making most use of the paper page space available. Three A0 pages wide by three high. This will give you the best detail (largest scale) for a given geographical area, all else being equal. Large map made to a specific size. If you have a wall space you wish to fill, you’ll need to measure it first – width and height. For example let’s say you have a wall space 3 metres wide and you want to physically fill it with usable map. The map above would be too wide at 3.51 metres. If we trimmed it to two pages wide, it wouldn’t fill the available space – 2.38 metres. In such cases we adjust the size of the “printable map area” for each page to meet your requirements, like this.. The result is the best detail (largest scale) for the area you want mapped at a physical size to fit into your available wall space – the optimal map solution! There are still some considerations about scale though. 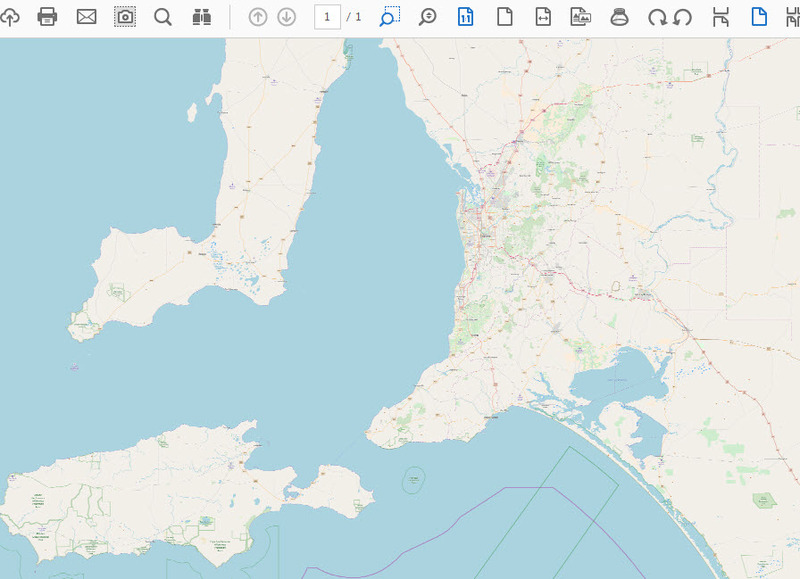 In the examples above, even though the map is large, Australia is also very large and that means the detail can only reveal so much at a single scale. For example Adelaide, SA is at the top of page 8. Here’s what it would look like when printed.. This example was exported at a resolution of 600dpi (dots per inch). Physical printers have a maximum dpi they are capable of reproducing and for most 600 dpi is the top of the capability. While we can make the dpi higher so more detail can be seen on the digital version, it will not carry through to a printed version if it exceeds the dpi capabilities of the printer. Of course in this example, not all streets are visible, which is where we might need to consider including inset maps for some areas, making their effective scale larger. Some printer models will print higher resolutions, so if it is important, phone around your local print businesses and ask them what their top print resolution is. We can make the resolution to suit (be aware that higher resolution means larger file sizes which, in turn, require more memory resources on the printing equipment. If problems are encountered with large high resolution document printing, it is often because the host machine does not have sufficient physical memory or is not running an operating system capable of using it – 64 bit almost always required).